In the summer of 1988, John Marous posed in front of the corporation's logo at the Downtown headquarters. It wasn't something John Marous did often. But on June 29, 1990, the Westinghouse Electric chairman sneaked out 15 minutes early. As he was inching past the Heinz plant on Route 28 during rush hour on the way to his Fox Chapel home, his car phone rang. Marous picked it up. "You know you're not supposed to leave early on your last day," the caller joked. It was Jack Welch, chairman of rival General Electric. It was a bittersweet moment for Marous. Welch had become chairman in 1981, when he was only 45. He'd probably be on top through the turn of the century, if he followed custom. GE liked to name their chairmen at a young age and keep them there. Marous, on the other hand, was 62 when he became chairman. He had had only two-and-a-half years. The next week, Paul Lego, 60, would be the fourth chairman in seven years. Marous had been married to Westinghouse for 42 years. Heck, he had spent more time at the corporation than he had with his wife of more than 30 years. "Circle W," the symbol for Westinghouse, might as well have been stamped on his forehead. But if the separation made him feel melancholy, what he achieved made him proud. Marous was leaving behind a solid legacy, one that would assure his standing in a community where he also was board chairman of its largest university. Profits expanded at double-digit rates, sales of continuing businesses had grown almost as much, and return-on-equity hovered above 20 percent. These were the goals he had set from the outset, and they had been met. After years of dismissing Westinghouse as a grab-bag of far-flung businesses, even Wall Street appeared to be taking note of "The Best Unknown Known Company in America," as Marous liked to call it. In the summer of 1990, Westinghouse stock hit a record high of $39.375. It would never be that high again. When he had gathered his management team at the Duquesne Club just before Christmas 1987, days before he officially became chairman, Marous laid out his vision. Westinghouse must boost sales 8.5 percent a year and annual profits by more than 10 percent. It must fix or lose underperformers. It must invest in more growth businesses. And it had to get more international -- "The world is going global," he said. It was a phrase Marous used often. He was known as "Mr. International." 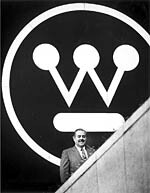 He ran the corporation's international operations for eight years, a reward for devising a strategy in 1979 to increase Westinghouse's overseas presence. Westinghouse CEO John Marous followed in the shoes of his predecessor, Douglas Danforth, as he continued to make decisions based on increasing shareholder value. He unloaded one of Westinghouse's oldest businesses, the electric transmission and distribution business -- a large transformer is pictured at the above left -- to ABB, a Swedish-Swiss venture, while holding onto the power generation business -- a generator is pictured at the above right. He held onto Thermo King, the international refrigeration transportation division -- photo in center is of truck that serviced the Moscow McDonald's in 1990. He was on a first-name basis with former Secretary of State Henry Kissinger and most heads of state in the industrialized world. He made forays into China, helping lay the groundwork for a breakthrough venture with Shanghai Electric. He was, in short, Westinghouse's ambassador to the world. When publisher Malcolm Forbes threw a lavish 70th birthday party at his palace in Morocco for 800 guests -- a global Who's Who of corporate, entertainment and political titans -- Marous was there. He even hired a Duquesne University music student to record a personalized version of "Happy Birthday" for Forbes. At the Duquesne Club meeting that Christmas, each executive was given a list of expectations -- for the company and for their divisions. Marous made it clear his expectations were to be met. And, starting in January, he would check his managers' progress every Monday morning at a mandatory breakfast meeting that began promptly at 7. Marous loved lists. Earlier in his career, he had stumbled for a response when asked by an employee to define "excellence." He reflected on it, devised a list of qualities he felt defined excellence, and printed the list on cards that he later handed out: pride, desire, teamwork, attention to detail, and follow-through. At the weekly management meetings, Marous would have a list of exhortations at the ready for downtrodden or pessimistic executives. "He would say, 'There are no problems, there are opportunities,' and 'Don't just bring me bad news, bring me solutions,' " recalled one former senior manager. And toward the end of each quarter, Marous would reel off a list of one-shot things that could be done if the company was falling short of profit projections. It might be booking license fees from foreign partners a month early, reclaiming as earnings unused reserves from previous asset write-downs, or selling Westinghouse's stake in a joint venture. "That mentality got communicated down, and people started looking for short-term fixes," said one former top lieutenant. On this December 1987 day, his list was actually three lists. There was the A list: businesses Westinghouse could feel good about. These included broadcast, energy, defense, Thermo King (its refrigerated transport division), and Westinghouse Communities (its Florida land development arm). All were OK and among the leaders in their markets. Then there was the B list: businesses that needed help. 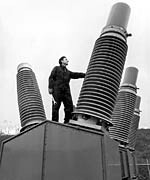 These included a transmission and distribution division that made high-voltage transformers, capacitors and other large equipment that took electricity from its source to the user, as well as a similar division that made circuit breakers, wiring and other electrical distribution and control devices. Finally there was the C list: businesses that weren't close to meeting goals and would require too much investment to bring up to snuff. Marous wanted to clean the slate of B-list businesses -- they had to be upgraded to A, or they would drop to C and be gone. If the strugglers needed acquisitions to succeed, he would spend the money. Indeed, Westinghouse spent more than $1 billion during Marous' brief tenure snapping up a half dozen companies. 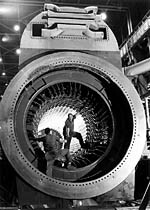 The moves rounded out Westinghouse's naval defense business; expanded its electrical equipment and office furniture operations; made its Group W the nation's largest radio network; and strengthened its position in the waste-to-energy and hazardous-cleanup fields. At the same time, Marous, like his predecessors Douglas Danforth and Robert Kirby, was quick with the pruning knife. The $500-million-a-year elevator division was sold to Schindler, of Switzerland, and the $1.4 billion-a-year transmission and distribution equipment business went to ABB Asea Brown Boveri, a Swedish-Swiss venture. The transit car and people-mover division was sold, as was 7Up bottling. It's easy to quibble with the sell-offs. The elevator business, for example, was on its way up again by the time it was sold. Transmission and distribution equipment was where the action would be in a deregulated utility industry seeking better ways to sell its product to buyers all over the country -- and Westinghouse held a virtual monopoly in the business. And the market for new transit cars and airport people movers subsequently would take off. But it's a divestiture that he was unable to make that may keep Marous -- and successor Lego -- awake at night. Early in his tenure, Marous received feelers from Gulf & Western, another old-line conglomerate, which was rapidly breaking up under its new chairman, Martin Davis, asking if Westinghouse wanted to swap its broadcasting group for G&W's Associates consumer finance unit. Marous and Lego had other ideas. Maybe the New York-based company could take their finance subsidiary and Westinghouse could take all or part of G&W's Paramount Studios, which produced movies and television programming. The discussions never got very far. Davis was intent on becoming a media giant and ultimately would transform Gulf & Western into Paramount before Paramount was absorbed in another entertainment mega-merger. It didn't seem to matter much at the time. After all, Westinghouse Credit was the hottest business going in the corporation's entire portfolio of businesses. Marous added to the company's broadcasting properties through radio station acquisitions, among other things. Taken from the 1987 annual report is a photograph of a "For Kids' Sake" segment. Profits at the once-sleepy appliance and equipment financing unit jumped from $22 million in 1980 to $106 million in 1986, while assets -- primarily loans -- jumped from $1.9 billion to $5.7 billion during the same period. And it was just getting revved up. A July 1986 strategic plan put together by consultants under Danforth called for even faster growth, with an emphasis on riskier but more lucrative corporate and junk bond financing, speculative commercial real estate loans and direct loans to developers. The message, former Westinghouse Credit employees say, was go out and make deals, deals, deals. Let the dark suits and pencil pushers have their Gateway Center offices. One Oxford Centre, the financial subsidiary's home, is where the action was. "The electricity was incredible -- it was just like the movie 'Wall Street,'" said an investment analyst who worked at Westinghouse Credit for three years, starting in mid-1988. "It was young, by corporate America standards. And the objective was to put money out the door." That they did. Teams of young dealmakers, cell phones in hand and calculators in their pockets, went forth with bushels of money. The bigger the deal, the better -- and the more rewarding. Incentives were based on the dollar volume of loans, not their quality or quantity. For years, no more than $10 million could be lent to any one customer. In the mid-'80s, that was raised to $25 million. But if there were limits in the late '80s, they weren't apparent. By early 1988, one customer, Phar-Mor, the fast-growing Youngstown, Ohio, discount drugstore chain, had received $50 million and ultimately would get $150 million. By the end of 1988, Hillman Properties, an arm of Pittsburgh's Hillman Cos., obtained a $225 million loan to buy a 12-acre parcel in downtown Los Angeles for a proposed $1 billion development. Westinghouse ultimately would lose most of its money in both ventures. It's true the worst commercial real estate collapse since the Depression caught a lot of lenders off guard. But by 1989, a time when empty buildings were becoming commonplace and personal and corporate bankruptcies were surging, Westinghouse was just gearing up. It had backed off a bit in commercial real estate, but was still plowing ahead with risky corporate lending. Like other finance companies, Westinghouse Credit was virtually unregulated and proud of it. It liked being a lender of last resort. It welcomed deals its regulated brethren, banks and thrifts, couldn't or wouldn't do. And for good reason: It got hefty upfront fees and charged high rates. Few would question the rapid growth, which would see loans and other financial assets top $13 billion by mid-1990, more than doubling their levels in four years. And why would they? Westinghouse Financial Services and its lending arm, Westinghouse Credit, were doing what they were supposed to do. The finance unit's leader, William Powe, a former Marine who took over in mid-1988 when 17-year veteran John McClester retired, came up through the real estate lending side. He was a dealmaker, always had been. He was simply making a lot more of them now, for a lot more money, for the man he answered to -- John Marous. Marous didn't care to know much about loan details. He just wanted the results. A good athlete -- he once toyed with playing professional baseball -- Marous was a rah-rah, get-it-done type, a motivator who used sports analogies and props to make a point. In a video that was shown at a February 1988 pep rally in Boca Raton, Fla., for Westinghouse Credit employees, he was shown shooting baskets at Boston Garden and outlining his principles of doing business. At one weekly management meeting, he handed out football jerseys to emphasize everyone was part of the team. He also was a yeller and intimidator. Staffers and fellow executives would cringe when the cuss words started flying. But Marous never meant it personally and would often apologize later. He just wanted to make sure his positions were understood. It was a go-get-'em environment that Powe, like most real estate developers, thrived on. And it was sure a lot easier reporting directly to Marous than it was before Marous was chairman, when the head of credit reported directly to the parent company's chief financial officer, Leo Yochum. Yochum was a tough cookie. He would review any loan over $3 million -- finance staffers called the documents they had to send him "Leo letters." And he would make sure Westinghouse Credit stayed within strict lending parameters. Under Marous, there was a new oversight committee that would review all loans, but it was largely a rubber stamp. Though it included finance officers from the parent, it also included Powe and was packed with credit executives -- the people responsible for the loans in the first place. And the committee was overwhelmed. Two days before a meeting, its members would get a huge packet containing as many as 900 transactions, each up to 50 single-spaced pages. Several said they had little choice but to trust the information they received and the people who were giving it. Of course, none of this seemed to matter much at the time. The fire that would engulf the finance subsidiary and ultimately Westinghouse itself wouldn't begin raging until late 1990, well after Marous was gone. In 1990 the Financial Services division used investment banking firms such as Merrill Lynch & Co. to sell $1.8 billion of Westinghouse Credit long-term debt. There were hints of trouble. Net income dipped slightly at Financial Services in 1989. And in early 1990, amid mounting thrift failures and bank losses, credit-rating analysts began expressing concerns about the financial unit's potential exposure. Standard & Poor's lowered debt ratings a notch on Westinghouse Credit in April 1990. The next month, an unsuspecting Lego was peppered with questions about Westinghouse Credit at an analysts' briefing. Still, there were just suspicions, nothing concrete. Just before he retired, Marous did take one final action to calm the ratings agencies and maintain Westinghouse Credit's high ratings. He signed a support agreement stating that the parent company would repay any debts and cover any losses at the financial services subsidiary. In other words, Westinghouse Electric would make up any shortfalls. No one knew at the time, but it was the beginning of the end.